Tag Archive | "Carbon monoxide"
Michigan Department of Natural Resources conservation officer Mike Evink, who is originally from Grand Rapids, and now serving in Michigan’s Upper Peninsula. Photo from Michigan Department of Natural Resources. Michigan Department of Natural Resources conservation officer Mike Evink rescued a man earlier this month who was overcome with carbon monoxide while trying to save a homeowner. The incident occurred at 3:43 p.m. Wednesday, January 11, when Evink was dispatched to a home along Hutt Lake Drive in Schoolcraft County, which is in the mid-eastern portion of the Upper Peninsula. A deliveryman for Suburban Propane had gone to fill a propane tank at the home of 59-year-old Ronald Haug. Arriving at the house in Inwood Township, the driver noticed Haug on the floor of his garage. The 55-year-old deliveryman went into the garage and tried to revive Haug with cardiopulmonary resuscitation. He also called emergency operators at Central Dispatch. Evink, who had been at Indian Lake State Park, roughly 15 miles away, went to the home, driving his four-wheel-drive patrol vehicle through 5 or 6 miles of unplowed roadway to reach the house. Once there, he saw footprints leading into the garage. “I opened the service door to the garage and saw two individuals on the ground,” Evink said. Evink said the deliveryman had a pulse and was breathing, but was unresponsive. Mr. Haug had no pulse and also did not respond. The men had been overcome by carbon monoxide, a colorless, odorless toxic gas. Mr. Haug did not survive. An ambulance with advanced life support paramedics from Manistique Public Safety got to the house at 4:24 p.m., about 15 minutes after Evink had arrived. “Had Mike not arrived when he did, there would have likely been two fatalities,” Hagy said. The deliveryman was in stable condition when he was rushed to Schoolcraft Memorial Hospital in Manistique. Officers interviewed him Thursday night. He was being treated and monitored. The source of the carbon monoxide is still being investigated. 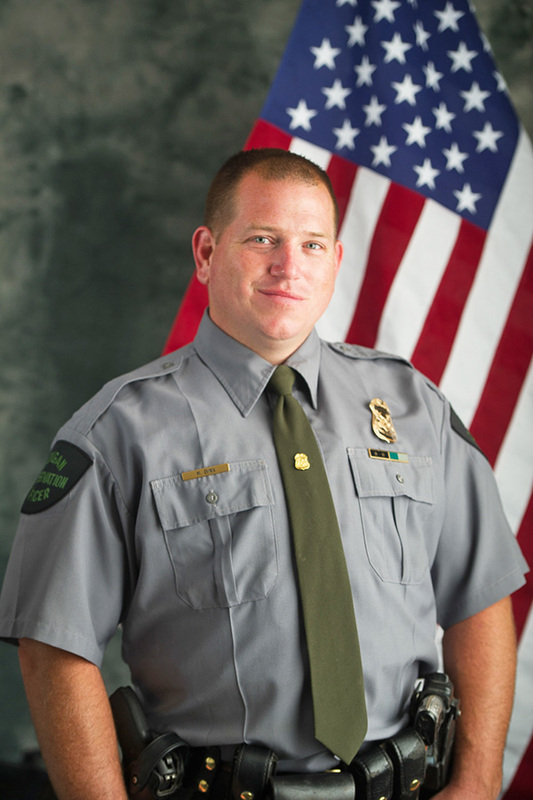 Four days earlier, in a search and rescue incident, Evink was involved in aiding two stranded snowmobilers in Alger County who say he and U.S. Forest Service law enforcement officer David Tembreull saved their lives. David Vorhes, 64, of Trenary and Mike Lasley, 56, of West Bloomfield were riding east of Munising in a backcountry area in Burt Township. “We were stranded out south of the Kingston Plains when we placed a 911 call to (the) Alger County Sheriff around 6 p.m.,” Vorhes said in a message commending the efforts of the two officers. Vorhes said the two riders were broke down and lost, off trail in 4-5 feet of snow, along the Clyde Lake Road, north of Trail 88 and 43, south of the Adams Truck Trail. “It was blowing and cold that night,” Evink said. One of the snowmobilers had just crossed a lake and buried his sled in snow coming off the ice. The second rider went to get help and his machine broke down. “The engine seized,” Evink said. Arriving in the area deputies had picked up from cellphone signals, Evink and Tembreull began following snowmobile tracks into the woods and, eventually, footprints. “Somehow they were able to find us showing exceptional recovery skills, noticing our footprints in a gully then following them until they came upon us,” Vorhes said. Evink said the officers found the two riders in a makeshift shelter they had fashioned under a pine tree. “We had no illumination, light or any sort of emergency preparedness kit—a cardinal sin when venturing out in any conditions into the remote Upper Peninsula,” Vorhes said. The officers activated their patrol lights to let the snowmobilers know they were police approaching. “They saw our lights and started walking toward us,” Evink said. After freeing the snowmobile that had been stuck in the snow, the officers and the snowmobilers rode about a half mile to the place where the second sled was broken down. Determining the engine would not start, they unhooked a belt so the track of the sled would freely spin and the machine could then be towed to a place where it could be retrieved the following day. Vorhes said this added about two hours to the rescue effort. “Put simply, Dave and Mike were going to make sure that not only were we returned safety, but our equipment was also returned safety,” Vorhes said. “With weather conditions of zero degrees, without wind chill, winds gusting between 25-30 mph and snowing heavily, creating a very low visibility, they were not fazed or detoured by these conditions. Evink said the two snowmobilers were cold, but coherent. The riders began to warm up as they helped in the work to get the sleds out of the woods. The men were found about 2.5 miles from Alger County H-58 and only two-tenths of a mile from the Adams Trail. “With the way the winds and the snow was blowing that night, they would have had no idea they were that close to the road,” Evink said. The riders were taken back to a staging area where they were met by an Alger County Sheriff’s deputy who returned them to Munising where they spent the night with a relative. “With Shared areas of responsibility, and with an emphasis on inter-agency cooperation, the U.S. Forest Service law enforcement officers and conservation officers oftentimes work together in cooperation to achieve our various management goals,” said Tembreull, who is from L’Anse and has worked with the Forest Service for the past decade. On the night of the search and rescue, Tembreull and Evink were conducting a joint patrol looking for registrations and safety violations. “I believe it is important to maintain and foster a strong interagency relationship and assist each other in the best way possible to benefit the public and natural resources,” Tembreull said. After working for a year as a law enforcement officer with the city of Cadillac, Evink was hired as a conservation officer with the DNR in 2010. A native of Grand Rapids, Evink was assigned to Schoolcraft County and he has been on patrol there since. As temperatures continue to hover around 0 degrees with wind chills at 25 below or colder, citizens are encouraged to be aware of the dangers associated with carbon monoxide poisoning when using alternative heating sources to warm their homes. Carbon monoxide is an odorless and tasteless gas produced when fossil fuels—such as coal, gasoline, natural gas and oil—are burned. In only minutes, deadly fumes can develop in enclosed spaces. When you breathe carbon monoxide, it enters the bloodstream and cuts off delivery of oxygen to the body’s organs and tissues. The first symptoms of carbon monoxide poisoning may be headache, dizziness, confusion, fatigue and nausea. As more of this gas is inhaled, it can cause unconsciousness, brain damage and even death. If you do suspect carbon monoxide poisoning, move yourself, your family and pets to fresh air quickly and immediately call 911. Never use generators, grills, camp stoves or other gasoline or charcoal burning devices inside of homes, basements, garages, or near a window. These appliances give off carbon monoxide, which can build up quickly in a home. Follow operating and maintenance instructions for fuel-burning appliances and equipment. Do not use a cooktop or oven to heat your home as these appliances are not designed for this purpose and may result in carbon monoxide poisonings. Do not let a vehicle run in an attached garage. Do not sleep in a room with an un-vented gas or kerosene space heater. Ensure your home has a battery operated carbon monoxide detector, which can be purchased at local home improvement and retail stores. Get your furnace checked every year to make sure it isn’t leaking carbon monoxide. LANSING. The Michigan State Police, Emergency Management and Homeland Security Division (MSP/EMHSD) asks citizens to be aware of the dangers associated with carbon monoxide poisoning as many use generators to power their homes and heaters during the ice storm-related power outage. Carbon monoxide is an odorless and tasteless gas produced when fossil fuels — such as coal, gasoline, natural gas and oil — are burned. In only minutes, deadly fumes can develop in enclosed spaces. When you breathe carbon monoxide, it enters the bloodstream and cuts off delivery of oxygen to the body’s organs and tissues. · DO NOT use an oven or range as a heater. · DO NOT let the car run in an attached garage. · DO NOT use a gas or kerosene space heater inside a home, garage, cabin or other enclosed space. · DO NOT sleep in a room with an un-vented gas or kerosene space heater. · DO NOT operate fuel-powered engines – such as generators — indoors. · DO NOT use a barbecue grill indoors. · DO follow operating and maintenance instructions for fuel-burning appliances and equipment. For more information about being prepared before, during and after an emergency or disaster, go to the MSP/EMHSD’s emergency preparedness website at www.michigan.gov/beprepared or Twitter page at www.twitter.com/MichEMHS.